I watched the Paralympics in pride and wonder. To see well trained athletes performing to such incredible standards in spite of their disabilities was truly inspiring. Quick, skilfull movements, bordering on the dangerous at times were exciting to watch and the satisfaction the athletes felt at their achievements were a joy to see. The obvious pleasure of the participants taking part at every level was enormously satisfying and the knowledge that 'Great Britain' 'Big Business' and 'The Unions' were behind the enterprise, prepared to contribute to the athletes' training and the quality of their equipment, must have seemed like the culmination of a wonderful dream. Added to this they had the knowledge that The Public was supporting them along with the Volunteers and The Army. For once I appreciated the oft repeated phrase, 'We're all in this together.' The unifying force prevalent throughout the 'Games' was simply tremendous and we all knew at the time that Britain was truly unique in offering the planning, imagination and care in bringing about this great spectacle of the Paralympics for The World to see. I felt only one sense disappointment during the whole fortnight. The number of events accessible to the disabled athletes was understandably confined to certain sports, but I could not understand why the game of 'Snooker' had not been included. I know a number of very good disabled snooker players who were equally as puzzled. I believe the last time the sport was played at an Olympic level was in 1988 in Seoul when it really buzzed along and then after that there does not seem to be any evidence that 'Snooker' was ever included again in the table of events. I ask this question because I know that although 'Snooker' demands high levels of skill, dexterity and movement, it is a game accessible to disabled people, and without the need or use of specialized equipment. My Father, Ray Harrison, was highly successful at playing this sport and also highly successful in promoting 'Snooker' to many disabled people. He formed a team at the old Lodge Moor hospital in Sheffield and spent many hours training others while enjoying the game and the atmosphere himself. Dad was in a wheelchair, a victim of Polio, but he had learned how to lift and move his body into certain positions which gave him full control of the snooker table. 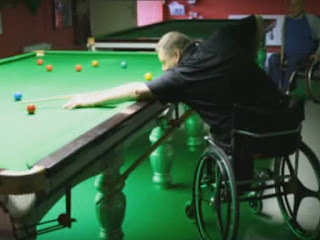 One report published in the Sheffield Star in 1984 stated, 'Ray moves fluidly around a table both backwards and forwards at speed, and it was hard to believe he was handicapped as he had developed his skills to a fine degree which had enabled him to overcome the physical restrictions of his disability.' At the time Ray had stated to the reporter that there were not many shots that a disabled person could not make. In his opinion you just had to become proficient in positioning the white ball to make it easier for yourself and then you could enjoy the game. Mick Langley (Paralympic Snooker Champion 1988) said, "Ray Harrison was a legend, he was one in a million. He taught me a lot about the game of snooker and I believe that I wouldn't have achieved half of what I have achieved if I would never have met him. What a great man!" Using this method enabled Ray to play the sport to a very high level, winning three important medals, silver, bronze and finally the much coveted 'Paraplegic World Snooker Champion Gold Medal' in 1985. He was also described as the perfect ambassador for disabled sport and travelled to Denmark, Iceland and Malta to compete and appear on their T.V. channels. In 1984 he was given the opportunity to travel to America and was greatly disappointed when this competition was cancelled due to a lack of sponsorship. But that was then when the ordinary members of the public did not fully understand how important big sponsors were and when venues, sporting fixtures, special facilities and travel arrangements were more difficult to put into operation. And this is now 2012 where we value and encourage the determination and spirit that disabled people have in abundance and how important it is when sponsors can be found to help the athletes bring about success not only for themselves, but also for the reputation of the country. Dad was such an inspiration. He taught me the sport and never lost his enthusiasm, ambitions and hopes no matter what setbacks he experienced. He would have loved this period and revelled in the successes of the athletes and I know he would have found a way to enter into the thick of it. He would also have encouraged me in the type of work I am concerned with. 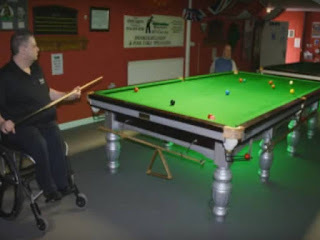 I know from my own experiences that the game of Snooker is not only accessible to people with physical handicaps it is also a terrific sport for helping people with weak, concentration powers. I train people who find focusing on strategy, learning where to position the balls and which part of a ball to strike with the cue incredibly difficult, but I have found that with patience, respect and specialized tuition they can enjoy the sport follow the rules and learn how to improve their standards. I am very keen to see the sport of Snooker reinvigorated and reintroduced into the next Paralympics which has been held in Brazil in 2016. With this in mind I'm asking for general support in backing my idea and request. I'm planning on writing to the Olympic Committee and contacting Seb Coe and Mr Deighton to ask for their advice and if anybody else knows who else I could contact to try and put this request into operation I would be grateful to hear from them. I'd also be pleased if some of the top players in the country would approach members of the Olympic committee to make a similar plea for the reinstatement of the sport as they would obviously have more clout than I have. The more people I can find who will support me in this endeavor the greater chance it will have of success. We all know that achievements are important in the lives of able bodied people, but even more strongly celebrated when we achieve after a struggle. 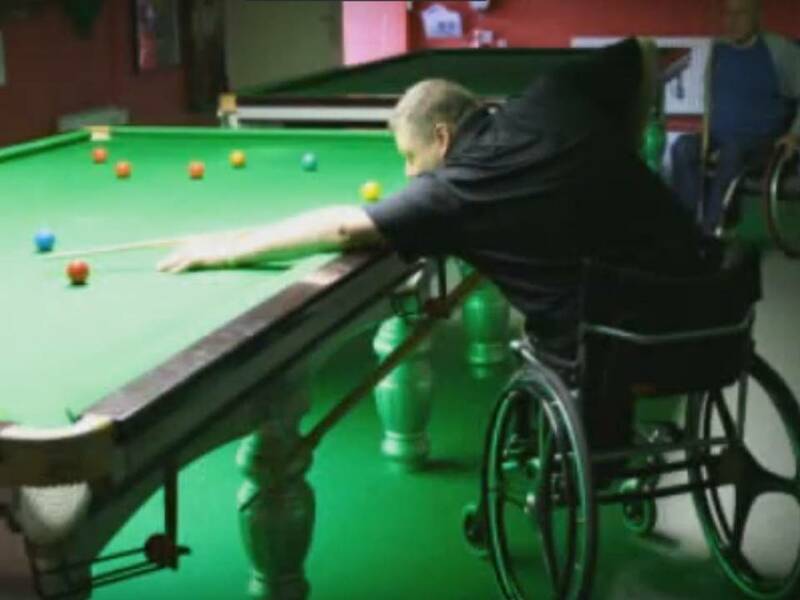 I therefore would like to see this sport included in the table of events in the next games as it is so accessible to both able and disabled people at every level. 0 Response to "Story of Snooker at the paralympics sports"